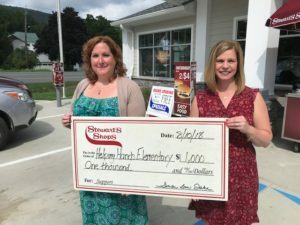 On Friday, August 10th, Deanna Hansen and Berlin Elementary Principal Tracy Kent attended the Grand Opening of the new Stewart’s in Berlin. Stewart’s graciously donated $1,000 to the Helping Hands group at BES. Helping Hands operates our food pantry, supplies clothing, and gifts for the holidays for families in need.